A Blog for Digital Marketers in the Construction, Engineering and Construction Products Sectors. 2017 is nearly here and it’s time to start planning those objectives right? Hopefully you’re well under way with it anyway. To help you define your objectives, here are 3 big trends I’m seeing which may or may not impact your digital strategy next year. Do a broad search for your product. You’ll notice some ads at the top with an image and a price. That’s Google Shopping feed. You’ve got an image. You’ve got a title/description. You’ve got a price. And you’re organic listing has been pushed off the page or just pushed down out of view. It means, you are no longer getting the traffic you once used to get – now your stockists are diverting some of it away from you to them. Most likely, it’s subbies, homeowners, contractors and the like who once used to come to your website but now go to an online stockist. Seeing a price is a crucial aspect in this. Specifiers, may still come to your site who are more performance/design led – but may prefer an online stockist also to get a price. I’m seeing a 5-15% drop in organic search traffic YoY (small drops each month) across many building product manufacturer websites to key category pages. It’s to early to say this is the reason, but it certainly is pointing that way. This drop is the traffic which once came to you – no longer needs to. Not all. Just some. But still enough to take it seriously in 2017. Build closer relationships with these online merchants. Work together. A big trend to take note of in 2017 is the rise of “task based tools”. 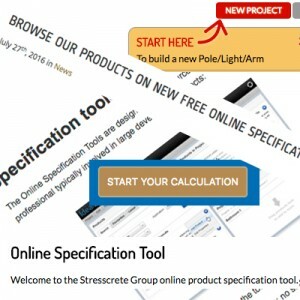 Many building product manufacturers have been doing this in the form of simple calculators but now many are also re-positioning from ‘information’ led websites to ‘task based’ websites and launching very comprehensive online task based tools with rich user experiences and multi device capability to help one do their job faster and better. If you can embed your building product website and tools into your audiences workflow – you’re onto a winner baby! It means that if you still have a brochure website – it’s time to wake up. Pull your finger out. Go learn and understand your audiences workflow and develop/create something that will help them do their job faster and better – and more accurately. If your competition already has something, then go do it better than them. Brochure sites create one night stands. Task based websites create longer lasting relationships. Websites with some form of task based tools continue to see large volumes of repeat visits and re-logins to accounts. This is where loyalty lies. As well as offering a superb technical support service complimented online too – be it through tools, live chat facility or social media channels. If you haven’t already, you need to start thinking about building some sort of tool to help users select the right product for the right application or to carry out a simple specification to help specify your product for a project. Either way, it’s not just about downloading brochures anymore. Something I’ve noticed occurring more frequently on Google search results pages is the inclusion of “featured snippets” or “rich answers” for building product related search queries. 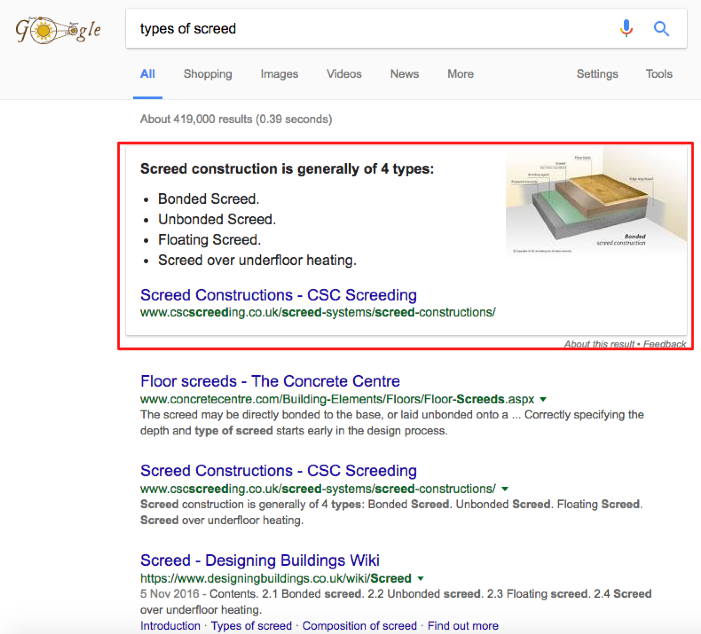 Featured snippets are boxes at the top of a results page which appear for question based searches. They usually display an extract and an image from the content on the page which best matches the query. Where snippets have been shown for content I know of, traffic has spiked massively. Another benefit is that it helps build brand awareness and establish your company as an expert in the topic. However, I’ve seen snippets come and go and you can see the spikes in traffic when posts have been picked up by Google and the drop the next. I think if the click through rates (CTR’s) are low for your content – you’ll be swapped for someone else. Google is constantly tweaking and testing different snippets. So one day it might be you, the next it might be your competitor. Also, on many occasions, the snippet shown is actually from a piece of content which isn’t even ranked in the top 3 positions of Google. An SEO win!! So it means, when you’re publishing content in 2017, you’re going to have to pay EVEN MORE attention to writing clearly and to the point, presenting content in a clear way, formatting and structuring it properly – all before hitting the publish button. There’s no set formula to get your content picked up by Google – but the posts which I know have been included usually contain short paragraphs and answer the topic of the post in the opening section and for list type posts, you will need to format your page so bullet points or numbers are formatted properly. 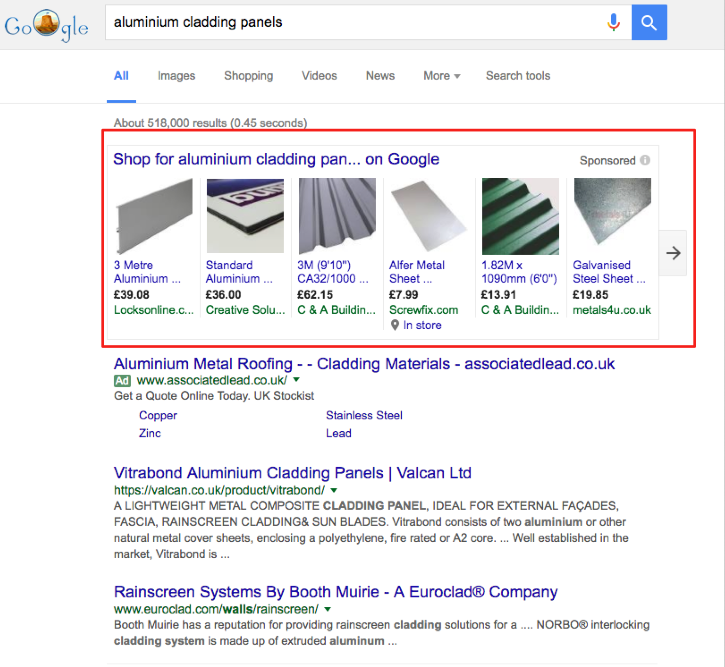 For more info on featured snippets then have a read of this: Google Featured Snippets. So there you have it. A few things there to be looking out for and considering for 2017 and will be something added to your list of objectives when it comes to traffic growth and building loyalty. Digital Marketing Consultant (Freelance) specialising in the Construction sector. I help marketing departments set objectives, discover goals, set KPI's, plan and develop campaigns to exceed set objectives. I also provide training on Digital Marketing Strategy Planning and Google Analytics. We’ve launched a company blog – now what? Which of these two construction products websites would you want to be responsible for? Digital Marketing Consultant (Freelance) working with UK construction companies helping them to increase visibility online, increase conversions from their websites and to advise on digital strategies. Anyone used Pimcore CMS/Framework for e-commerce sites?